Now that the Juno probe has entered Jupiter’s orbit the team at NASA that has already had an amazing mission at a cost of $1.1billion to NASA will now be able to study the solar system’s largest planet. Check out the videos below to learn more about the Juno Mission to explore Jupiter and its moons after a five year journey from Earth. 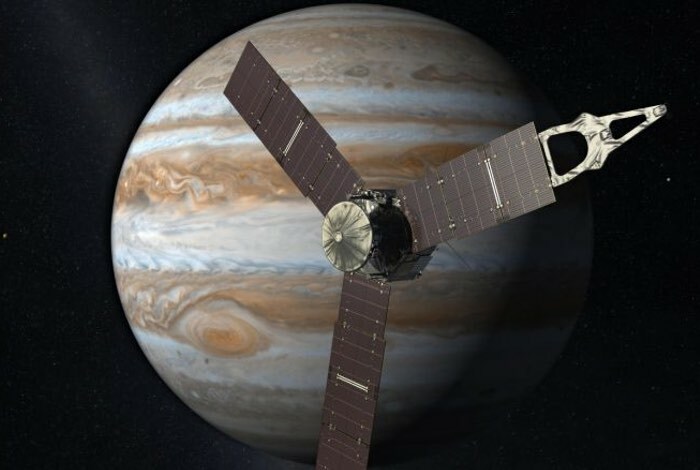 Finally seeing Juno the solar-powered spacecraft “squeezed through a narrow band, skimming Jupiter’s surface, avoiding the worst of both its radiation belt and its dangerous dust rings”. Secrets lie deep within Jupiter, shrouded in the solar system’s strongest magnetic field and most lethal radiation belts. On July 4, 2016, NASA’s Juno spacecraft will plunge into uncharted territory, entering orbit around the gas giant and passing closer than any spacecraft before. Juno will see Jupiter for what it really is, but first it must pass the trial of orbit insertion. Fly along with NASA’s Juno spacecraft at Jupiter. Turn on your sound to find out more about the planet, the mission and the spacecraft. Click and drag the view on your computer, or move your mobile device up and down and around to explore the entire 360-degree experience. Note: Not all browsers support viewing 360 videos. YouTube supports playback of 360-degree videos on computers using Chrome, Firefox, Internet Explorer, and Opera browsers. Use the YouTube app to view it on a smart phone.